The latest version of Video Studio comes in two versions, the plus version and the non plus version. 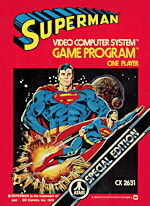 Initially the program doesn't look that different from version 9, but extra features have been added. You can now capture, edit and output HD Video with an HD camcorder, you have support for Dolby Digital 5.1 surround sound, MPEG-4 support for exporting video for playback on iPods or Sony PSP players, and future support for HD DVD and Blu-ray DVDs. This last option was to be included in the program, but a slip of paper in the small manual (and I literally mean small in size, it's just a little bigger than an A6 sheet), states that as the specifications of the formats have not been established at the time of authoring, all those features have been removed. Presumably an update via the auto update feature will add those features, but as yet there have been no updates to the program. Once installed, VideoStudio 10 Plus gives you three options to begin with. 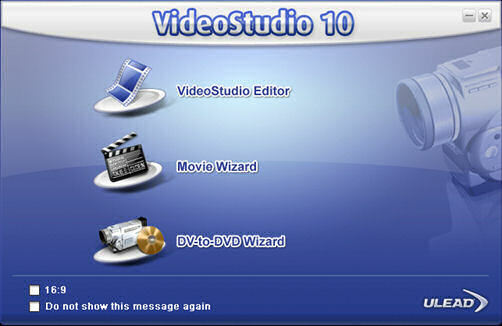 VideoStudio Editor, Movie Wizard, and DV-to-DVD Wizard. The Editor is the full program and the option most people will want to use. You can also choose whether to edit in standard 4:3 aspect ratio or the widescreen 16:9 format. These are quite common features now, but Videostudio uses Smart Proxies to help edit HD video. HD video files can be enormous, and many older PCs will struggle when trying to edit them (Ulead recommends a 3.0GHz processor for HD work). When you turn this option on, Videostudio automatically creates lower-resolution versions of the HD video files, allowing you to edit the low-res files without slowing down your PC too much. When you're finished, the program will automatically apply your changes to the original HD files while you go off and do something more interesting than staring at a progress bar. It's possible to use the new surround sound mixer to control the placement of sound effects simply by using the mouse to move the audio indicator around on the mixer display to create your surround sound effects. However, the 5.1 mixer only allows you to mix audio from the first two video tracks, the narration track and the music track. You can pan your audio around the surround image, but the only way to animate this is via live mixing. There are plenty of new editing tools as well; the most important being the ability to add five extra video tracks to the program's editing Timeline - giving a total of seven video tracks in all. This makes it possible to create complex montages and picture-in-picture effects. The preview of these effects can be very slow but the final result will be fine There are also several new effects filters, such as Fish-eye and Anti-shake - the latter can stabilise clips shot on a hand-held camera. The online help files have an annoying habit of listing features without clearly explaining how they work. The manual doesn't fair much better and the small black and white pictures are not that clear. Ulead has recently merged with InterVideo, who made WinDVD player and version 7 is include as a bonus on the bonus CD. I did not install this but have seen reports that upgrading older versions lead to problems that can only be fixed by removing the old version first. Other bonus software programs include Cool 3D, which allows you to create eye-catching, animated 3D titles for your movies and Pocket DV Show which can be used to burn DVDs straight from your camcorder. Ad Zapper is a new feature that automatically scans a video file recorded from TV and finds what it thinks are the ad breaks, making it easy to delete them. Curiously, you can only use Multi-trim with videos on the first track, but most people are not likely to multi track recordings from television. Ulead has also changed the UI arrangement. Four presets are provided, with a less dominant preview window than in previous versions and more space for all the tools. For disc authoring, with DVD Movie Factory 5's engine built-in you get much more design control. SmartScene menus and menu transitions are available, and you can now resize, position and rotate buttons and text. It's a shame that elements you edit in the menu cannot be aligned to each other or to the grid that you can display, like DVD Workshop 2 (which still offers the most flexibility for DVD Menu creation out of all of Ulead's products). Even though the program has support for many different file types, it did have trouble converting them using the Batch Convert function. I wanted to convert some QuickTime trailers and although the video was fine and no errors were reported, the final video had no sound. I had to convert the QuickTime MOV files to uncompressed AVI files and then convert them to MPEG files. This may have been due to the codes used in the files, but it always gets me that if the QuickTime player can read the files, then why can't the video editing programs? The Plus version is definitely worth the extra cost if you want HDV support, Smart Proxy, Ad Zapper, Video Distortion (which was available in VideoStudio 9). 5.1 surround sound support, export to Apple iPods and Sony PSPs, MPEG-4 support Win DVD 7 Silver and Pocket DV Show.